Environmental economics through the game. Environmental Economics through the Game (CO2 permits). The carbon game is an online simulation game for teaching environmental economics and industrial organization. Players are responsible for managing competing companies specializing in consumer goods whose production generates very high CO2 emissions. They compete on several markets with different environmental policies. The game environment changes each year and requires players to adapt their strategy and to anticipate changes in the behavior of their competitors (changes in environmental policies, new technologies, cost evolutions, R&D, crises ...). At the end of the game, players are subject to a system of tradable emission permits. Understanding environmental economics through the game. 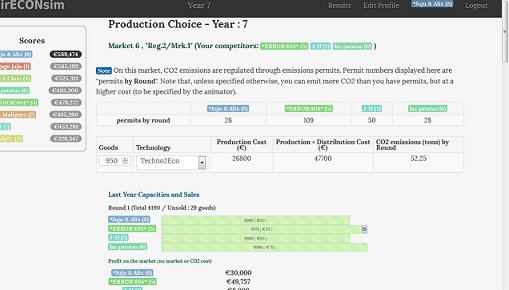 With the carbon game, players understand through practice, the major issues of CO2 emissions economics. Emission permits (tradable or not, binding or not, with or without banking, allocated in different ways). As a function of historic emissions. As a function of historic sales. With or without secondary markets. A mix of all these. We regularly offer (distance or traditional) trainings on environmental economics or industrial organization, for all levels. The usual duration of training is two days for a standard scenario, in French or English. Upon request, we also organize tailored interventions, over three, four or five days, using customized scenarios and/or our other games.